I have an on again off again love affair with bananas. They are so good for you and act as natures anti depressant. Because of the health benefits, I should eat a banana a day. But, I only like to eat them as the skin turns from dark green to yellow. A day later and I will put the banana into a smoothie made with yoghurt and honey, but any time after that I will not eat the banana. And so I usually only buy 3 or 4 at a time. Dave will eat the banana on day 3 but he too does not like over ripe fruit. A few weeks ago one banana went from green to inedible after a few days. I am loathe to throw anything away as I hate wasting food, but I was not in the mood to make banana muffins. Given how delicious my ginger bread tasted I used that recipe as the base to bake some banana bread. Dave is not a huge fan of baked bananas but we both enjoyed this bread. As it was only the two of us eating it, we ended up toasting the last bit for breakfast. This banana bread is so moist and perfect for toasting if you want some crunch. It makes great use of an over ripe banana. We eat bananas around here like monkeys… teenagers plow through 6 of them a day. However, if I can get to one of them I can’t wait to try your easy and delicious banana bread. Not a banana fan either Tandy – used to eat them a bit when we lived in Oz hardy ever now! HI Tandy, this sounds like a lovely, spicy banana bread. Yum! Yes, I eat bananas, but not as many as I once used to. I’ve been freezing bananas a lot lately so I can add them to my smoothies whenever I please. But I haven’t made banana bread in way too long, so I may have to switch it up soon! This looks delicious. YUM! This looks amazing! …and your smoothie recipe sounds so good! I actually tend to like my bananas a bit riper… like a deep yellow with some (but not too many) brown spots! My mum likes em green!! haha, so I guess we all have different preferences! I’m not a fan of bananas but eat one every so often (green!) as I know they’re good for me. Big Man loves them though but I’m often left with a few over ripe ones ad make banana bread – will definitely be giving your recipe a go! Our households sound the same! 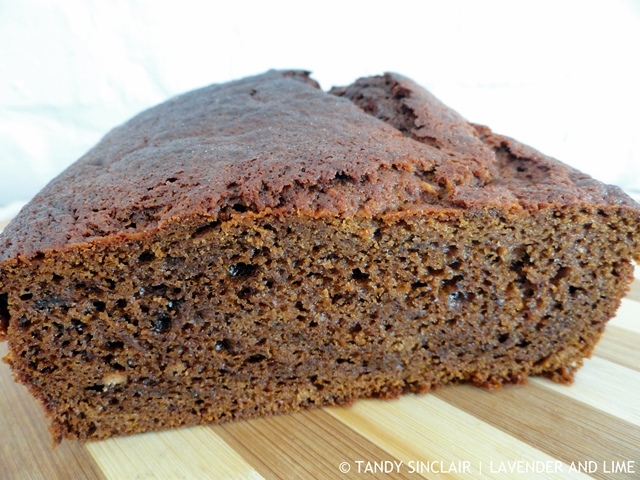 I really only love bananas in banana bread….this sounds so tasty! I too only enjoy bananas just off of green but wait for them to be black before I bake banana muffins or bread.